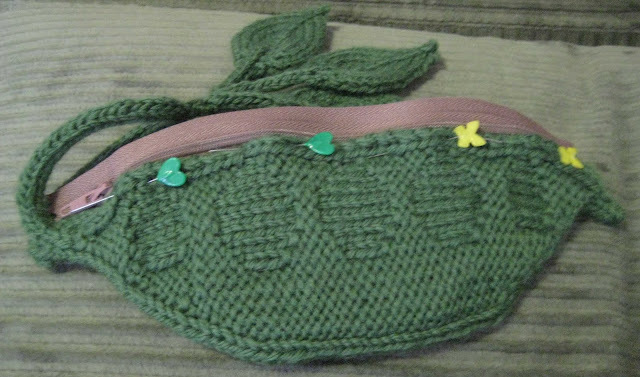 I bought the Elegant Edibles kit for two reasons; 1) it was a great value for the yarn and notions (I don't know much about zippers) and 2) for the pea pod purse pattern. I used size 7 double pointed needles. 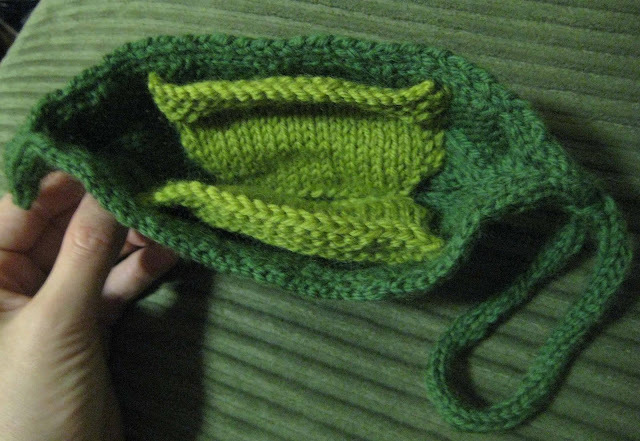 The purse is made out of less than a ball of each wool of the andes Jalapeno and Avocado. The final measurements of the purse (just the storage area): 8" long and 3" wide. While knitting, I loved the fact that the chart was pretty much to scale. Not that I was paying attention to gauge, but it helped me get a sense of how large the final product would be, and that I was on target for an appropriate sized purse. The body of the purse is finished... and the chart is to scale! The pattern included two pockets. They were knit in the contrasting color, and then sewn onto both interior sides of the purse... with the lighter green yarn. I was concerned about keeping these stitches invisible, but that ended up being much more natural than I had thought. The purse with sewn in pockets flipped inside out. 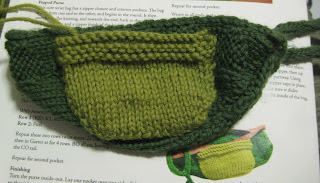 The peapod purse held open so you can see the pockets. Adding many more items will really fill out this purse quickly. I knit so many toys, so I don't always pay close attention to gauge. I knew that for this purse, it was most important for the fabric to be tight enough to hold objects, but I also needed to make sure that the included zippers would fit into the purse. My gut, non-calculated instincts ended up working out perfectly. I've never sewn a zipper before, so I was pretty nervous. I loved the way the purse worked, and I didn't want to ruin the project with bad stitching. I also didn't want the zipper to pucker or change the silhouette of the purse. I spent a lot of time zipping and unzipping the zipper as I sewed it in. I really took my time to make sure I inserted this properly. First I pinned one side of the zipper to the purse. 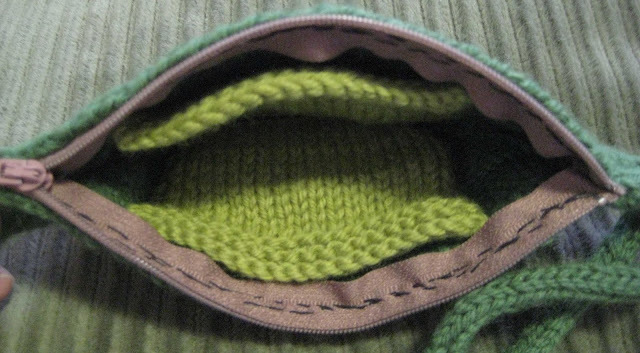 While lining it up, I placed it such that the edge of the knitting lined up just below the teeth of the zipper. I was hoping to make the zipper as invisible as possible. Both sizes of the zipper pinned into place. I had to unzip the zipper to start sewing. This was a fast and fun knit, easily whipped up in a day. 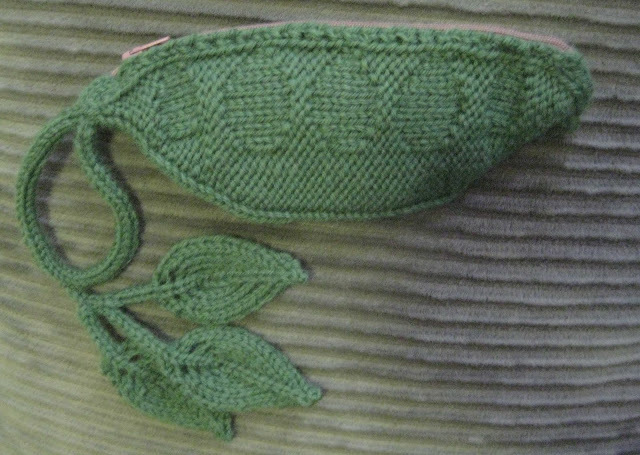 The leaves were fast and fun to knit, too. I even minded the Icords less than usual! I blocked each piece before I installed the zipper, again to make sure everything would line up perfectly. I sewed over the zipper two times to make sure it was secure. From the outside you cannot see the stitches, but they are clearly visible on the inside. That purse is so cute!!! I like it a lot :) But if your zipper isn't the same color as your item, you will be better off matching the thread to the item, otherwise you would have light brown stitches on the outside of your purse! @Wendy - you should make one! It was a really fun project.